Amy Thomas is offered a dream job of going to Paris to write ad copy for Louis Vuitton. Even though she has been to Paris before and loves the city, living and working there for an extended period of time is different story. She finds herself a thirty-six year old woman trying to fit in the dating scene in a foreign country where life is just so totally different from New York. Compound that with the fact she is having difficulty mastering the language and she has a real identity crisis. Her saving grace is her love of all things sweet. She travels all over the city and beyond to savor and feed her addiction and cravings. 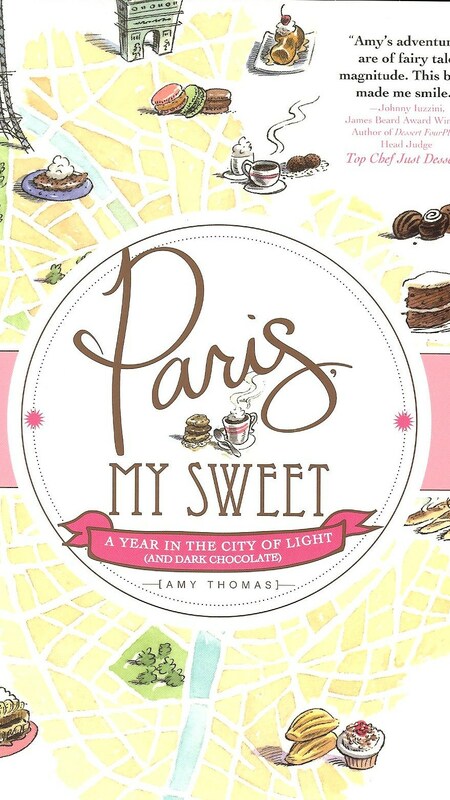 This is a wonderfully written memoir of Amy's adventures in Paris with her job at Louis Vuitton and her sampling of sweets during her time there and when she returns to New York for visits. There was not actually alot represented about her ad job with Louis Vuitton. The major portion of the book was her exploring different desserts at various establishments and her new found treasures of sweets. She went into great detail describing them almost with orgasmic descriptions. Sadly, I found nothing that I would just have to sample. Even though I like desserts, I am a very plain dessert person so nothing actually appealed to me. Although very well written descriptions, I found myself glossing over them at times because there was just so much. In amidst her sweet cravings, she gives us personal insights into her dating fiascoes and her difficulty in trying to fit in with the language barrier and lack of friends. The storyline is well written and contains a wealth of information considering the length of the book. I had little problem with the storyline except with such lengthy dessert descriptions, it became a bit wordy. I would have liked to seen a key for all the French phrases because I had no clue as to what they meant. Something I found quite unique was a listing of all the New York and Paris bakeries at the end along with addresses and phone numbers. The book also contains a map of Paris and New York with the bakeries shown with various desserts depicting location along with a written key telling the reader their names. Very appealing in my eyes. If you enjoy reading memoirs or just like a good story, I most definitely recommend this book. If nothing else, you will be craving desserts and the descriptions alone will have you bouncing off the walls. I think I gained ten pounds just reading about them. I wish to thank Sourcebooks for providing me with an a copy for reading and reviewing purposes. I was not required to write a positive review. I was not compensated in anyway except for receiving the book to review. I'm not much for memoirs but this one sounds interesting. Dana, thank you for stopping by my blog today.